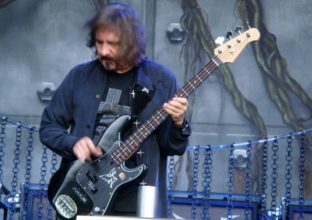 In the final episode of our first series, we look at the Geezer Butler Bass Rig. One of the most influencing musicians of all Metal genres. Geezer can be named the forefather of all things heavy in his own right, developing his own sound and accompanied writing. Drawing heavily upon his fascination with the darker side of the human condition, religion, horror, sci-fi and nuclear Armageddon. Geezer Butlers Bass Rig at present has consists of Lakland Basses and Ashdown Amplifiers but there is plenty more to his sound than that. Geezer’s career spans over 50 years and is known primarily for his work in Black Sabbath and again with the related band Heaven & Hell. Geezer recorded the first four classic albums Black Sabbath, Paranoid, Master of Reality and Vol. 4 all with the same bass. The paint from the bass was striped off leaving the bare wood finishing showing. This bass was seen in the early videos of Black Sabbath such as the Beat Club videos and the Paris live show from the 1970’s. During the tour of Volume 4, Geezer is often seen with a Plexiglass bass made by Dan Armstrong at Ampeg amplifiers. He’s said in interviews that his Precision bass was “smashed to pieces with a hammer” … somewhere between Detroit and Toronto. Clear acrylic polymer, Maple, bolt-on, 30″ scale with 24-fret, rosewood fingerboard. Pickups are interchangeable. This event took place on a Sunday where most shops are shut and at the recommendation of the music promoter found this bass in the only shop that was open nearby. This bass was stolen at the end of the tour in 1973. Located in Birmingham, John Birch created guitars for both Geezer and Tony. It was Geezer who first had the crucifix custom inlays that Tony is now known for. Geezer had three custom Birch basses made in the early 70’s. These basses have been mistaken for the Gibson SG series as the Birch workshop modifies and creates similar looking basses. These basses were modeled after the Gibson EB series, with softer horns and similar pickups that were interchangeable. In addition to this, the neck scale was shorter (30.5″ scale) than the usual Fender basses (34″ scale) at the time. This scale length was essential for drop tuning the bass down to C and C# tuning where there was less tension on the strings. Seen in the live tour pictures for Vol.4 and the Cal Jam Festival 1974. From 1975 onwards Geezer used basses created by John Birch’s co worker John Diggins. Diggins’ basses have a distinct soft V shape in the headstock and are branded Jaydee basses to separate himself from the Birch workshop. A Jaydee Roadie 2 was created for Geezer and used to record the albums “Sabotage”, “Technical Ecstasy” and “Never Say Die”. The body and head stock are a laminate of Maple and either Walnut or Rosewood. Pickup were custom made also and possibly known as Superflux. You can spot a JD bass by the bridge tailpiece which is coin shaped and has slots for two strings. The Birch basses in comparison are rectangular. Seen in the 1978 music videos “A Hard Road” and “Never Say Die”. During a live video performance during the “Never Say Die” tour in London.Geezer was seen playing a red Rickenbacker. This bass was used for this gig only as he forgot to bring his JD basses. Geezer bought it as a collector’s piece, originally owned by Glenn Hughes and used in Deep Purple. The “Never Say Die” tour was the last before Ozzy Osbourne’s departure from the band in 1978. Whilst not mentioned in the video, these basses have been spotted during the Dio era (1979-1992). The amplifiers for this period can be found in Geezer Butlers Amplifier Rig. I couldn’t use them (Vigier basses) in the studio because they were active, and so powerful. He also states in this interview he was introduced to Lakland basses around the year 2000, prior to Ozzfest. See our free downloadable guide for pictures (See below). The Joe Osborn signatures have a distinct Concentric Stacked Knobs making it appear button like. Normal Jazz basses do not have this option. All three are seen on tour during 2005, see UK’s Download Festival. In 2006, Geezer, Tony and Dio regrouped under the name Heaven & Hell to differentiate themselves from Black Sabbath. For these shows Geezer had the same basses mentioned above but with a colour change. This era was called “The Grey era”. This same equipment was used through Masters of Metal tour with Judas Priest in 2008. The Artist series BB was relaunched by Yamaha and sought well known musicians for endorsements. Geezer, Flea, Duff Mckagan, Glenn Hughes and Exodus bass player Jack Gibson were some who were seen. In 2005 and 2007 Geezer had two photo shoots sporting two different Lakland’s. These shoots were for a bass player magazine. Precision Jazz (“Shoreline Gold” with grey pick guard) Rose gold inlays. Henry sticker on the pick guard. Black Sabbath reunited in 2011 after the death of Ronnie James Dio and the dissolution of Heaven and Hell. In this period from 2011-2013 Sabbath recorded “13”. Lakland co-designed Geezer’s very first signature bass in Precision and Precision Jazz versions. 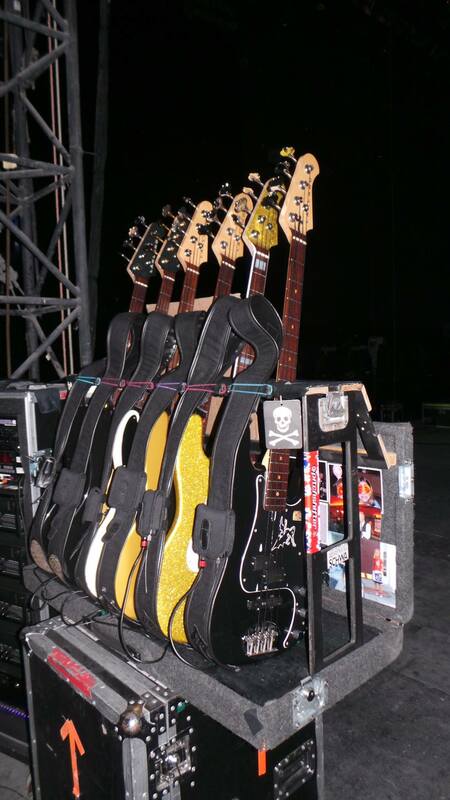 For the “13” tour, Geezer took “eight or nine” basses in all. Three main, three backups, one for the dressing room and one spare. His main basses are all signature models which are almost identical. Signature number 2 is identical but has plain head stock with a cross on it and rose gold dotted inlays. The “Henry” mascot is detailed in the 5th fret. Signature number 3 is a Precision Jazz and has rose gold inlays and matching pick guard. All black head stock. Fans and musicians united in November 2013 for a special tribute show named “Bass Player Live” where Geezer performed playing a vintage style Lakland. Geezer shared the stage with Zakk Wylde (Black Label Society), Charlie Benante (Anthrax) and Corey Taylor (Stone Sour, Slipknot), as well many as guest bassists to honour his career. Lakland 44-51 Precision with (Vintage Single Coil pickup) Black with White pick guard as well as 3 small “Henry” stickers. This is Lakland’s tribute to Fender’s 60th anniversary 1951 Precision reissue which was also put to market at the same time (causing some controversy). 44-64 Custom (Vintage P with J style Neck) Singe Precision (Gold sparkle, white pick guard) Jazz bass neck with pearloid block inlays. As there are so many Laklands mentioned in different configurations and varieties we would like to give you FREE downloadable picture guide. This has been the final artist in our first season but don’t worry. Part two of Geezer Butlers Bass Rig is coming up with a second video soon to follow. An update to the YouTube channel will be posted shortly where more news will be revealed about season 2. Have you seen our previous episode? In the last Know Your Bass Player we took a look at the Jason Newsted Bass Rig during his stay in Metallica.